My most glamorous friend Jessie was somewhat irked when her gorgeous daughter Livia requested a “fairy princess cake” for her fourth birthday as it meant (a) Jessie’s world would become even more pink and (b) she couldn’t have the rainbow cake on which she had set her heart when she saw my previous attempts. Not one to be so easily beaten, Jessie gently suggested a Wizard of Oz theme, which went down a treat with the discerning Liv. So, here we are. 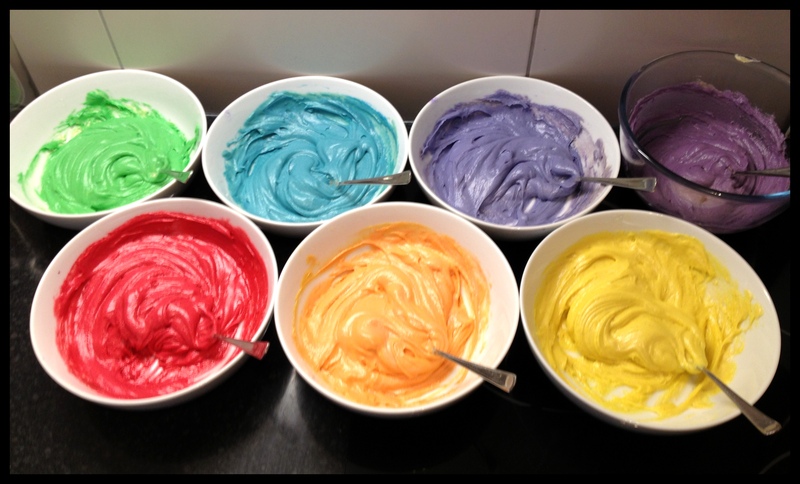 If you’re a regular reader of my scribblings, you will have endured plenty of Rainbow Cake waffle (see I, II, III and IV), so I shall keep that part short, focusing on the decoration bit later on. 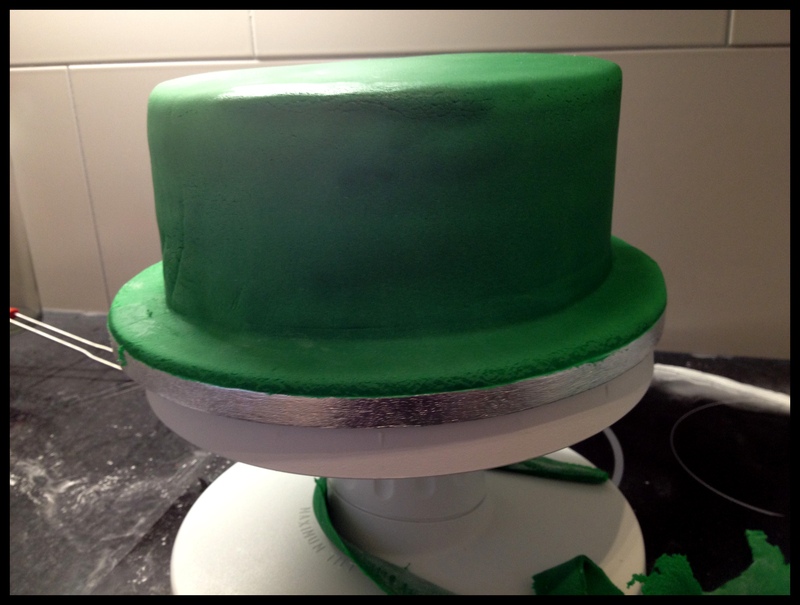 As I draped the rolled green fondant over the cake, I noticed the first signs of weakness on one edge, and I thought “Oh, no-no-no, I’m not having another cake-tastrophe like that” so I quickly put my hand on it to take the weight and work to secure the fondant to the buttercream before the weakness developed into a rip. 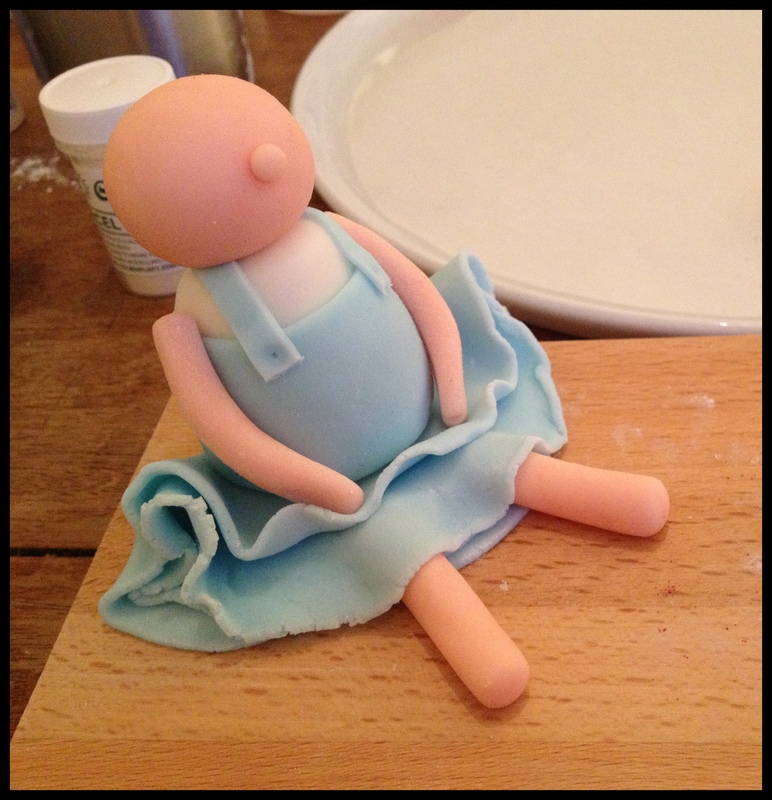 It was then that I felt the weird heat of the fondant and worked out what I must’ve done. Mercifully, it seems that the heat wasn’t on for long enough to ruin it (because that would have meant throwing away the entire endeavour and starting from scratch) nor start a fire. I have now added ‘switch off the [insert expletive here] hob before rolling anything’ to my list of preparatory steps. 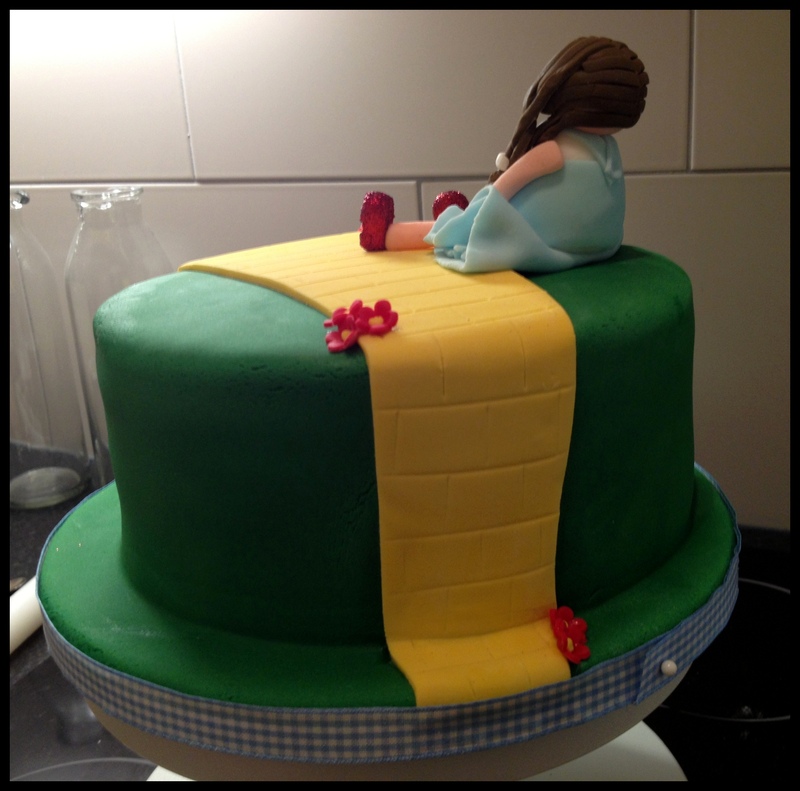 Now came the Yellow Brick Road, which presented its own challenges, including rolling it to the right thickness so that it wasn’t too wedge-like but was dense enough to remain vibrant yellow with no green hues coming through, cutting it to the right shape before draping it on the cake, draping it in such a way that it covered the most offensive imperfections in the green, smoothing it in situ without warping the shape, adhering it to the green without saturating it with water which could make the green seep through, that sort of thing. But I did it. 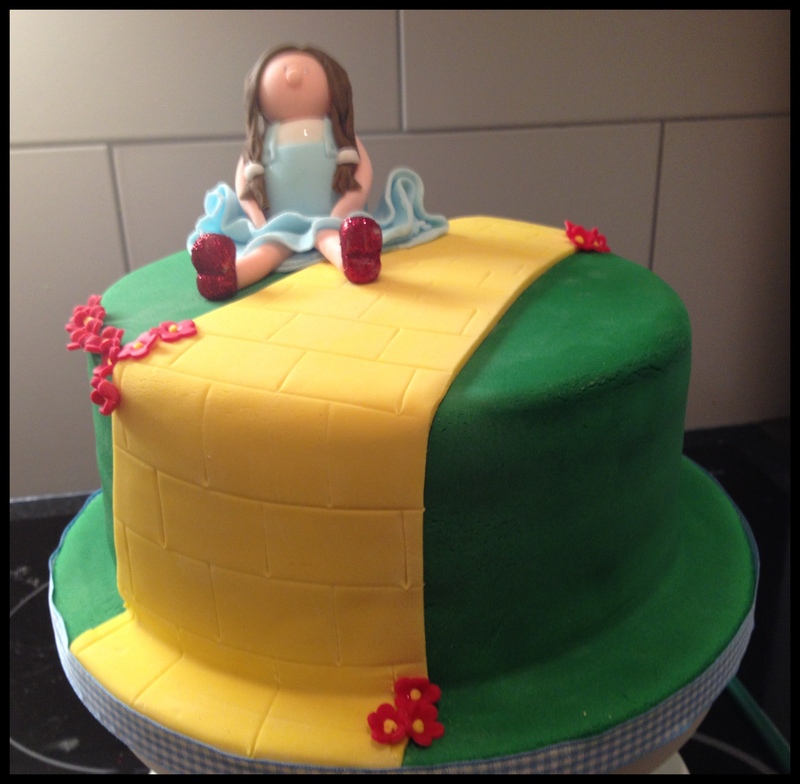 Then I gently trailed the blunt edge of a fondant sculpting tool across its surface to create brickwork, being careful to make the brick sizes match the perspective implied by the shape of the road (which becomes a rather ridiculous detail to care about when you see how MASSIVE Dorothy is, in relation to the road). 1. Starting with the torso, I made a blunted cone from white, then poked a cocktail stick down its centre for stability, leaving almost a centimetre poking out of the top. 2. I mixed up a decent quantity of pale blue (always make more than you think you need, as it’ll be impossible to match the shade later) and rolled out a simple rectangle for the bodice of the dress. I used edible glue to attach it to the torso, then cut a couple of strips for the straps. 3. I mixed up something flesh-colour-adjacent, and made a simple sphere for the head, which I skewered onto the torso’s cocktail stick. I used the edible glue to attach a little button nose. 4. Two simple cylinder shapes worked well for the arms, and as I was going for a cartoon style, I decided I needn’t spend hours sculpting hands – I just gently flattened the ends to make paddle-shaped hands. I cut another cocktail stick in half, prodded it horizontally through the top of the torso and poked each arm on, letting the hands fall where they may. 5. 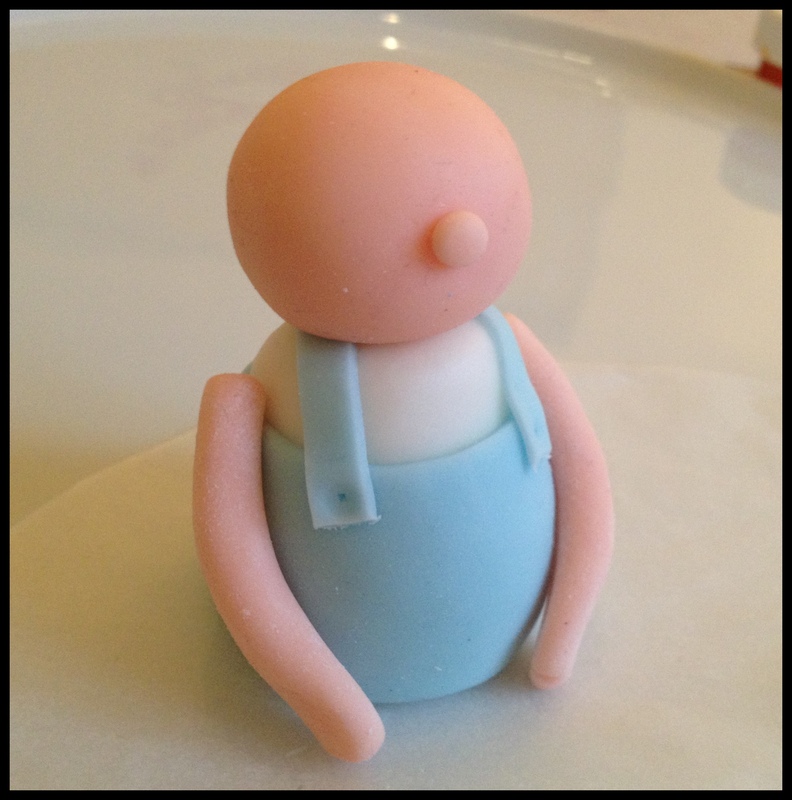 Next, I divided my remaining blue sugarpaste into two and rolled out two circles, quite thinly. 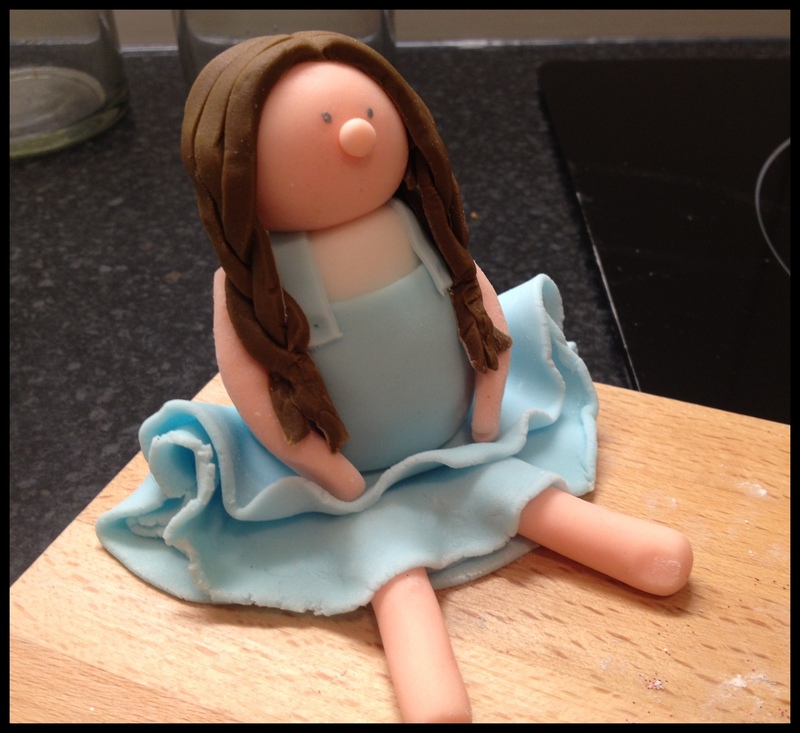 When it’s this thin, the sugarpaste dries out pretty quickly so I had to work relatively fast to ruffle each circle, then stacked them up and folded them in two because my top-heavy Dorothy was going to be sitting down. 6. Two more flesh-coloured cylinders and Dorothy had legs. 8. 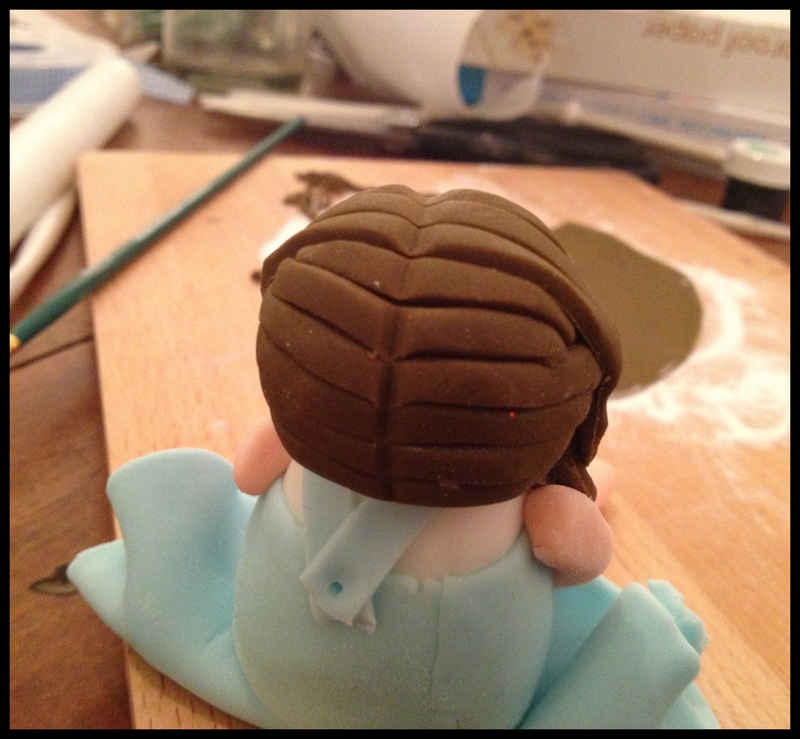 I laid out three strands and loosely plaited each end before securing it over the top of Dorothy’s head, at which point I took the blunt side of a sculpting tool and gave her a centre parting all the way down. 9. 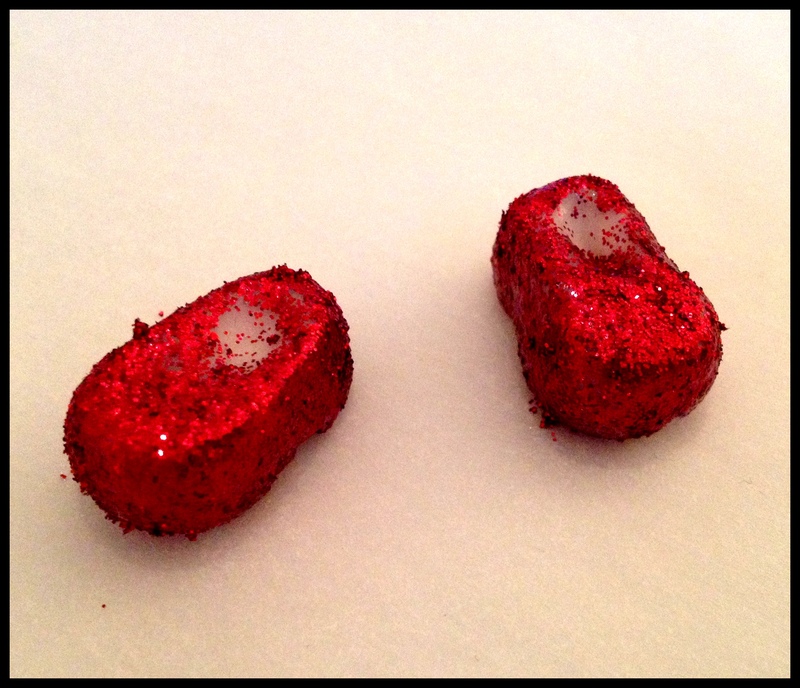 Ruby slippers! 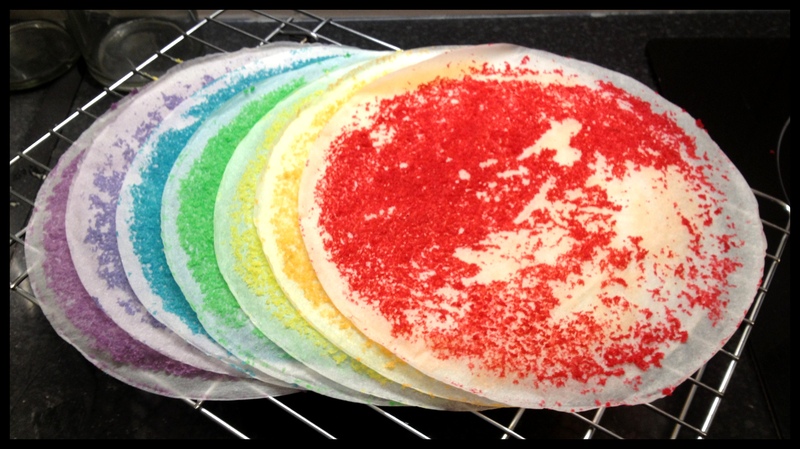 These were just a couple of blocks of white sugarpaste, which I roughly shaped and then painted first with water, then with red edible glitter. 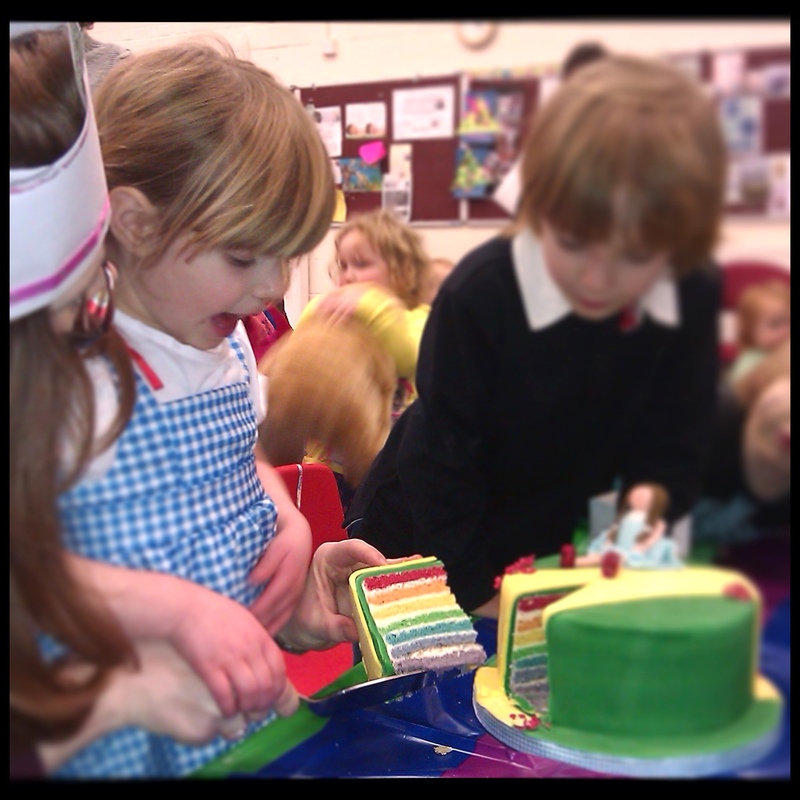 Then it was time to put it all together and apply the finishing touches, i.e. little punched flowers to hide visible imperfections in the rolled fondant embellish the scene, and a blue gingham ribbon pinned to the silver board. 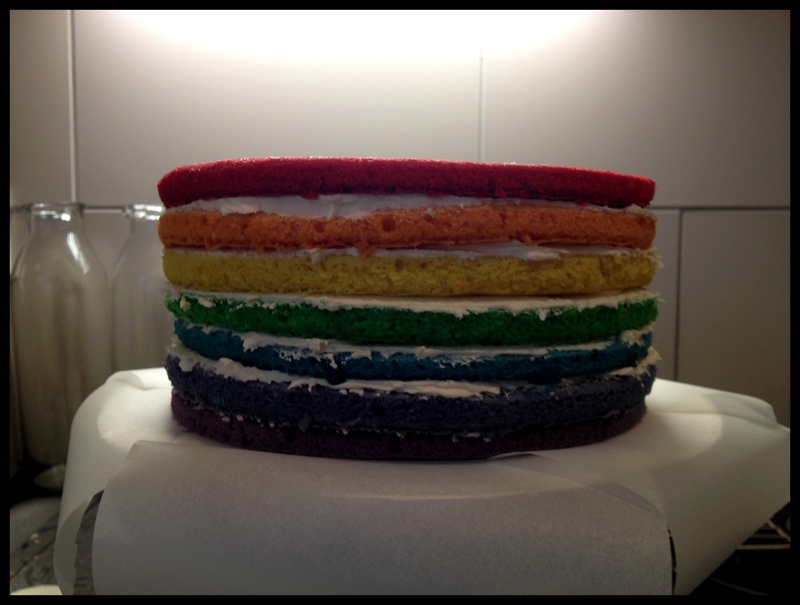 This entry was posted in Cooking & Baking, Uncategorized and tagged rainbow cake, sugarpaste modelling. 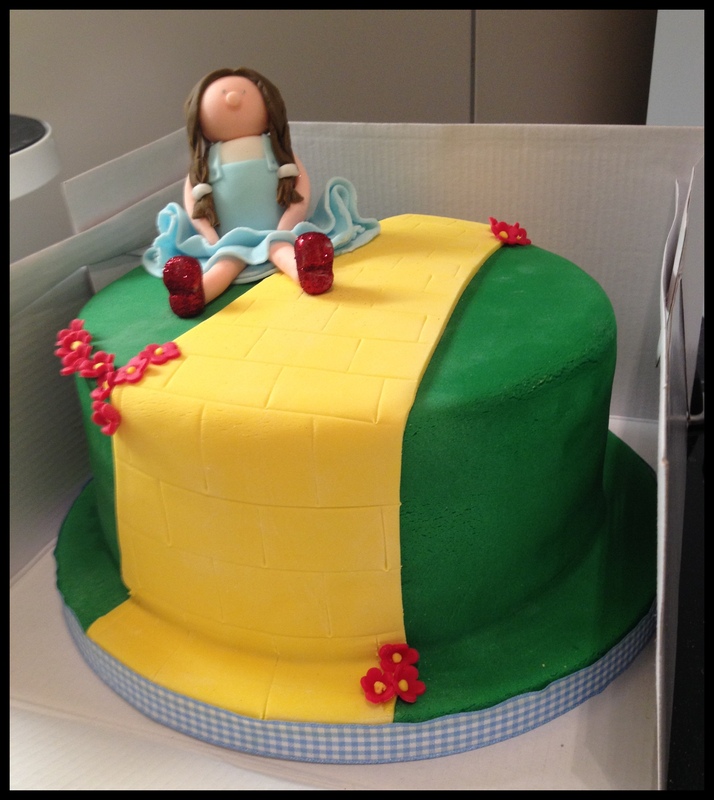 sugarpaste Dorothy, sugarpaste people, Wizard of Oz Cake by wordspicturesandcake. Bookmark the permalink. 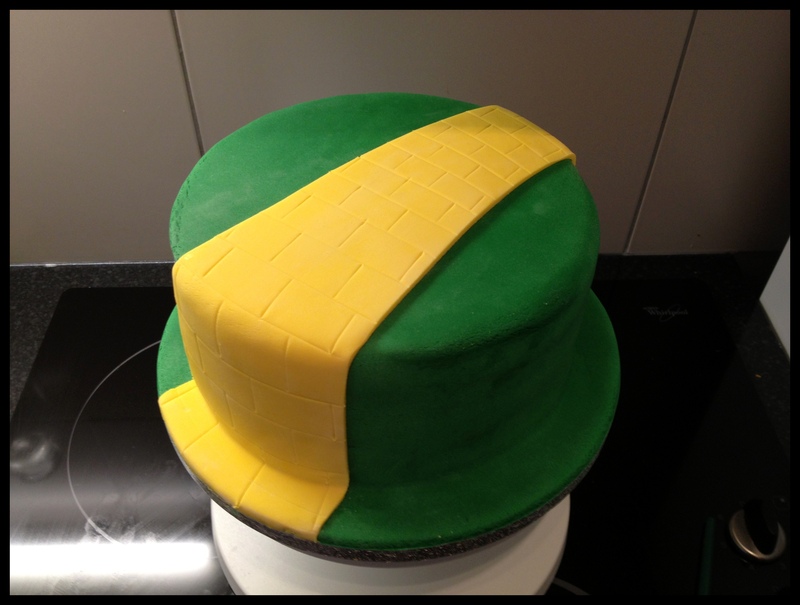 This is one of THE most beautiful cakes I’ve ever seen!! Bet it tasted yummy too!! Bloody hell Tweeds, just remarkable.